Google’s early Nexus phones showed us what could be achieved at a low price. There were some limitations but generally you ended up with a great-value, great-handling phone. Then the 6P appeared and offered some top-end technology in a large phone but still at a reasonable price. Now the new Pixel brand replaces the Nexus line and things have become as premium as you can get. This is because Google is using the Pixel as a showcase for its latest software and services – including the Artificial Intelligence-enhanced Google Assistant – which makes the most of the new Android operating system and its integration with Google’s Search and Cloud services. It also comes with the latest smartphone chipset, Qualcomm’s SnapDragon 821 and a bunch of other latest features mixed in with some of the best features we’ve already seen on the market. Not surprisingly, this all now comes with a massive price. Beyond screen size (the straight Pixel also has a 1080p resolution) the only other difference is battery with the 5-inch model using a 2,770mAh battery and the 5.5-inch model using a 3,450mAh battery. But are they any good and are they worth buying? 5.5in, 2560 x 1440, 534ppi AMOLED display; 32/128GB,4GB RAM; Qualcomm Snapdragon 821 quad-core processor plus Adreno 530 GPU, 12MP/8MP cameras; Fingerprint reader; NFC; Android 7.1; 3,450mAh battery; NanoSIM; USB-C; 154 x 76 x 9mm, 168g. Full specs here. The aluminium chassis feels very rigid and is comfortable to grip but we can’t help but be disappointed with the styling. ‘Phoned in’ would be a complement: It’s basically a box with rounded corners and a shiny bit on the back. Forget about the luxurious qualities of Samsung’s finest or the new jet black iPhone. At this price, they could have done better. Read more Which is the best travel SIM for Japan? Worse, despite showing off some funky colours at the US unveiling, Aussies are being lumbered with silver or black (Blue is a limited edition but only in the US). We haven’t seen the silver version up close but it’s physically impossible to look much duller than the black version. At least it’s better than Sony’s recent, boxy flagship, the Xperia XZ. The Qualcomm SnapDragon 820 chipset was the stalwart chipset of many top phones including Samsung’s Galaxy S7 and explosive Note 7. Finally we have its successor, the SnapDragon 821. In general use, it feels like there's a very-slight boost in responsiveness compared to other flagship phones, like the S7 and iPhone 7, but it’s not by much and could partly be attributed to using the latest Android Operating System. Whatever the case, it feels a bit faster than the competition, especially when launching the camera app. We tried putting a number on the performance with the Geekbench benchmarking software (it only scored 1,551) but it used the slower half of the quad-core processor (1.6GHz) instead of the faster 2.15GHz cores. It seems the phone is so new that the benchmarks aren’t optimised for it just yet. The same happened in PCMark where we achieved a score of just 4,627 – well down on the S7’s 5,774. We also tried the 3D Mark Sling Shot ES 3.1 benchmark and scored 2515 – which is slightly-lower than the S7’s 2,554. We take these with a pinch of salt. The results will increase as the tests get updated. Frankly, we’re more inclined to take chip-manufacturer, Qualcomm’s own word for the performance gains which quote a ten per cent gain for processor performance and a five per cent gain in graphics processing. That’s in line with our observations. In short, it’s a notch a head in terms of performance from what’s come before it. One of our favourite handling features is the rear-mounted fingerprint reader - it’s the most comfortable and quickest area to access. It also works with a gesture-based shortcut where you slide your finger down the sensor and the notifications screen appears. It’s a nice *cough* touch but not earth shattering. The screen itself is very good. The high-resolution (2560 x 1440) is similar to the Samsung S7 Edge (but without the annoying curved edges and the AMOLED technology ensures that colours are vibrant – although they don’t seem to pop quite as much as with the recent Samsung Galaxy Note 7. It’s still one of the very best on the market though. The high resolution and pixel density minimises the "screen-door effect" when using it with a Virtual Reality headset - we've suffered badly with that elsewhere. Note though that it can get incredibly hot when using it for VR. One area that has disappointed some people is the speaker. While this is fine for phone conversations (both private and 'loud') there's only one and it points down - which is arguably a retrograde step over the Nexus 6P predecessor's two, forward-facing, stereo speakers (here's a quick speaker comparison with the iPhone 7). While this is no deal breaker for many, it is a bit disappointing that this design decision (and reduced requirement for open, speaker grilles in the chassis) didn't come with full, IP67 waterproofing as we've seen on other flagship phones - the Pixels are barely splash proof (see below). The Pixel is the first phone to run a full version of Android 7.1 (code name: Nougat) Again, there’s not a massive leap from the previous version (code name: Marshmallow) but there are some nice tweaks. 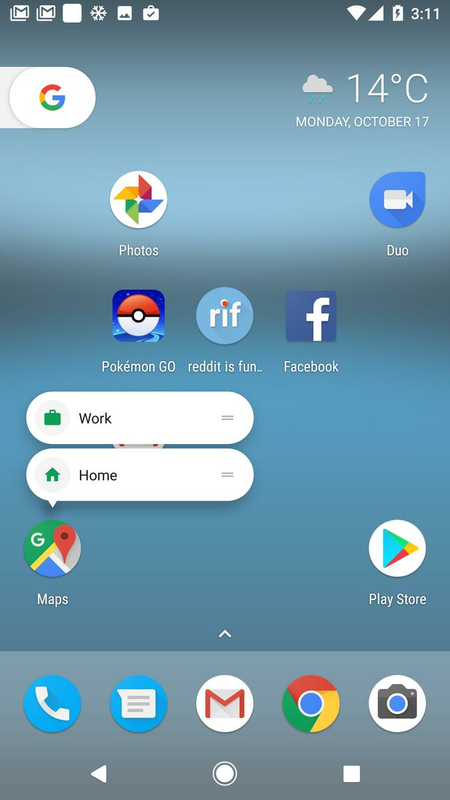 If you hold your fingers onto the main app icons, rather than get the option to move or uninstall the app (as with most launchers), submenus appear which offer a few more options. For example, if you hold down the Maps icon you’ll get the option to navigate directly to Home or to Work. With Mail, you can jump straight to compose. Google expects third-party app makers to add their own shortcuts here. We didn’t use it much but we expect this feature to grow in popularity over time. Android 7 gives you quick-access to sub menus with some apps. It’s worth reminding people that Pixel buyers (as with Nexus buyers before them) get Android software and feature updates first (they can otherwise take a long time to get approved by other vendors and carriers). Google guarantees two years of updates plus three years of support for the Pixel. The real highlight is Google Assistant. Many people will have used Siri and OK Google (and even Cortana) to varying degrees before now. This reviewer never stuck with any of them for long. But my head has finally been turned. 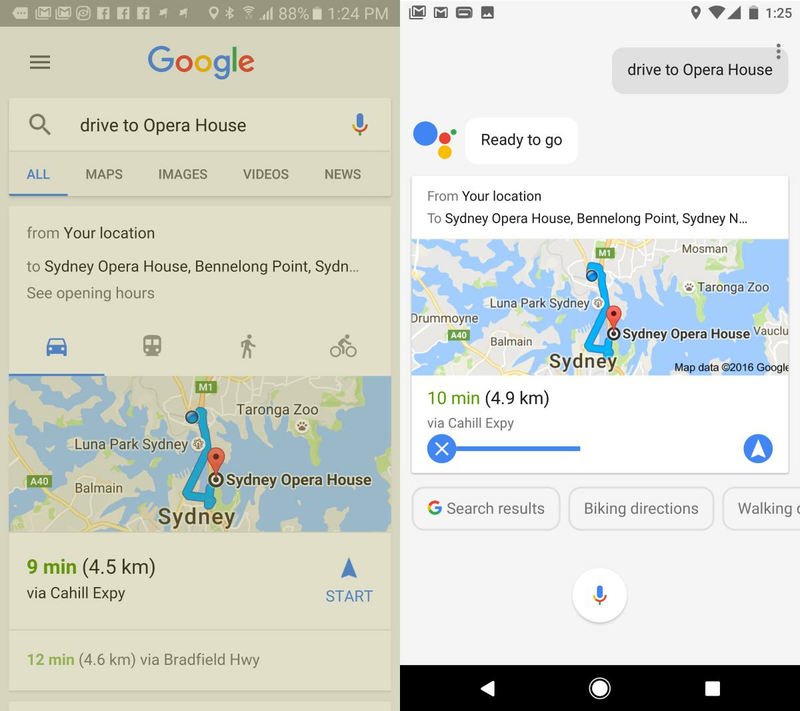 The difference with existing OK Google feature is minimal in terms of appearance but the added A.I. smarts nudge it that bit closer into, “Actually this is really useful” territory. Existing voice-operating power users may roll their eyes, but now when you ask it to do things like take a picture or navigate somewhere, it doesn’t just open the resulting app, it follows through and executes the command. 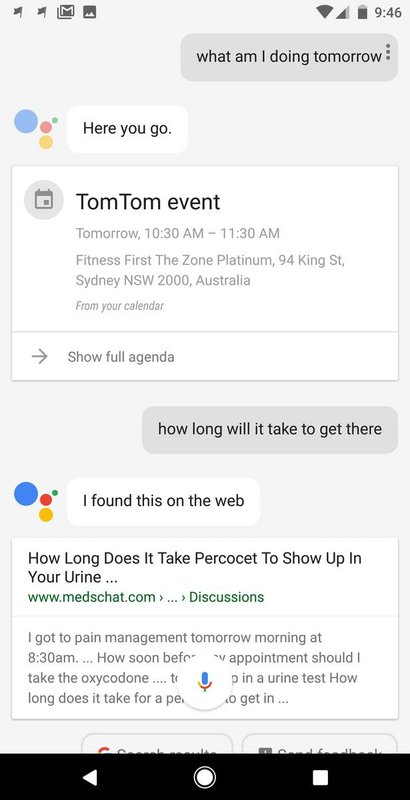 OK Google (left) would show you the best fit when asking a question. Google Assistant (right) shows it to you before quickly executing the command. It’s dramatically more accurate and useful than Apple’s Siri and the context-related smarts mean you suddenly find yourself conversing with your phone rather than slowly speaking in a language of keywords. It’s early days, but for the first time this is feeling properly useful. 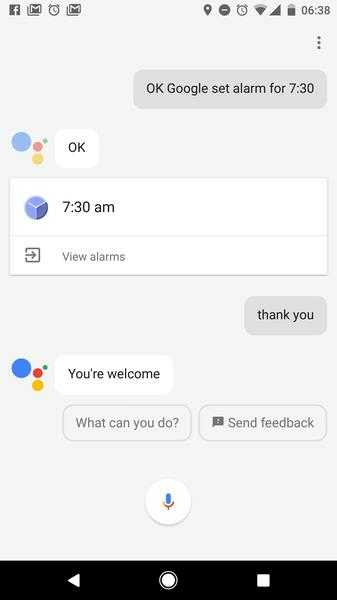 You do start to talk to your phone like a person with Google Assistant. We’ll discuss that more in the conclusion below but for now, don’t expect to see it anywhere else anytime soon. The A.I. smarts mean you can have a conversation with Google Assistant without repeating the same keywords. It understands context. Nonetheless, we've seen some impressive and funny conversations from Google Assistant since launch. If you want to try out Google Assistant (albeit without the voice recognition), you can do so using Google's Allo chat app right now on Android and iPhone app stores.